The aim of the flexible coupling is to transfer motion between two shafts on the same axis whilst accounting for possible misalignments. We have various styles of flexible couplings suitable for a wide range of applications. The quality of the materials used, the careful design and the precision in manufacturing ensure long lasting high performance, safety and reliability for even the most complex applications. Available in fully turned steel. Optimum protection against environmental conditions. Competitive pricing without sacrificing quality. “Made in Italy” with certified quality. ‘RIGID COUPLINGS (BACKLASH FREE)’: for connections when high precision and high transmission torques are required. ‘ELASTOMERIC COUPLINGS’: for connection between misaligned shafts with the need to absorb vibrations. Torsionally rigid disc coupling with angular backlash free transfer of motion. Transmission and maximum flexibility in operation. Available with personalized spacer. Rigid coupling, in steel, suitable for shaft connections with good alignment. Available in one or two sections. Bellow coupling in aluminium with high torsional rigidity. Backlash free, low inertia and high reliability. Elastomeric jaw coupling, good vibration dampening properties. Available with different types of elastomeric element. 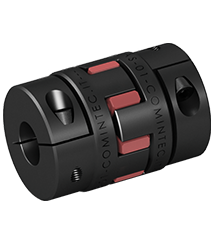 Compact elastic coupling, protected from environmental conditions. Fast maintenance possible without the need to move the shafts. Gear coupling without wear due to the polyamide sleeve, suitable for high axial misalignments. 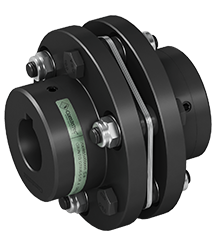 Flexible coupling with compact dimensions, suited for applications where high shaft misalignments are present. Maintenance without the need to move the shafts. Chain coupling, simple, economic and easy to assemble. Suitable for dry and dusty environments.